At the short moment I wrote Snappy+Inkscape 0.92.4 yesterday, I didn't realize that actually Inkscape 1.0alpha is now available as AppImage portable executable format for all GNU/Linux distros. Regardless distro you use, simply give permission to .appimage file, and then double-click it, then the program runs. See gif animation below. This is a good news. Starting from 1.0 development, Inkscape Project cooperates with Simon Peter (probono, the father of AppImage technology) to provide AppImage officially. See their discussion here. This decision is the same as LibreOffice's and Krita's, as they provided AppImage versions since a long time ago, and this will make software testing really quicker and repeatable for everybody. It is a really good decision. Just like Richard Brown (openSUSE chairman) ever said, I also say, I love AppImage. I love Inkscape as AppImage. 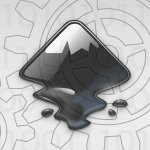 Please help test Inkscape AppImage on your respective distro and share it with your friends!